March 21, 2019 – It’s been a while since the Saints have had a ball bounce in their favor, but that’s just what happened Wednesday afternoon when a hard-hit ground ball by Garrett Mathes took a high hop that Viking shortstop Francis Villaman could not handle allowing Zach Hand to score the winning run in a 6-5 win over St. Johns River State College. The win breaks a three-game losing streak and SF head coach Johnny Wiggs said it was something the team needed badly. The Saints ninth started with Cade Westbrook reaching when a high inside pitch that hit off the handle of the bat and rolled fair toward the third baseman with Westbrook beating the throw to first. One out later Hand singled and Cale Jones followed drawing a walk to load the bases. Parker Biederer then tied the score with a single setting up the winning ground ball by Mathes. “Zach and Parker had big hits for us in the ninth,” said Wiggs. Mathes (2-0) pitched the final two innings in relief to earn the win while Connor Centala took the loss for the Vikings. Westbrook had three hits in the game for the Saints while Mathes, Hand, Isaiah Perry and Brock Edge had two hits apiece. 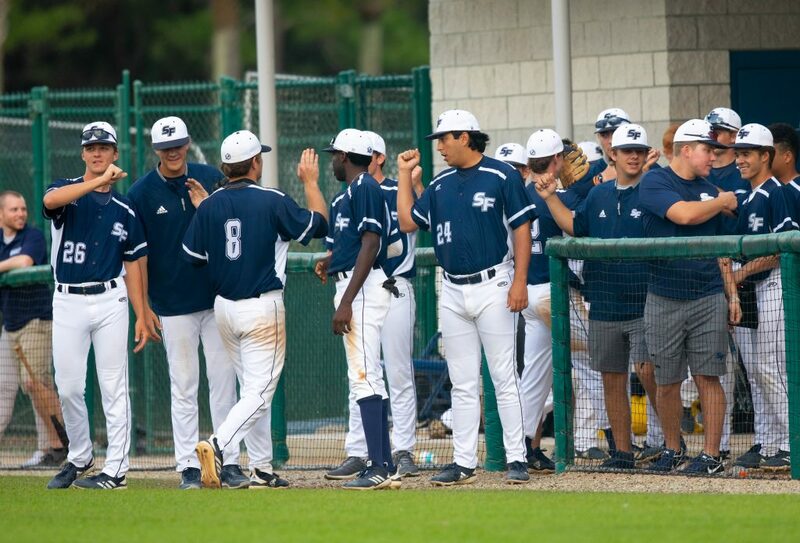 The Saints (21-11, 2-5 Mid-Florida Conference) and Vikings (20-10, 5-4 MFC) will play the second game of the three-game series in Palatka Friday evening with the first pitch scheduled for 6 p.m. Game three will be back in Gainesville at 1 p.m. Saturday.